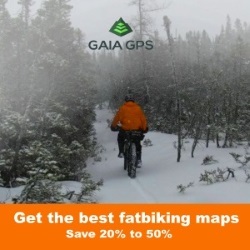 Wouldn't it be great to hop on your fattie and head out on a network of trails from your backyard? 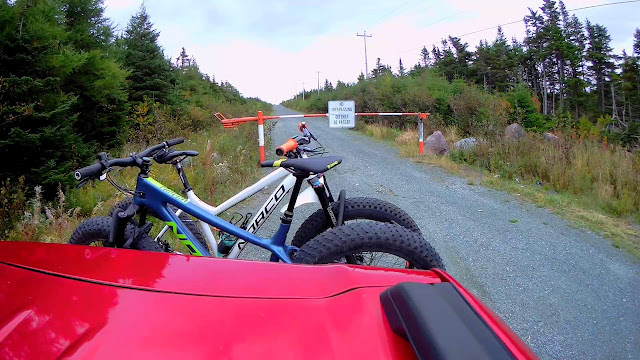 This may be a reality for some, but for the majority of us heading out on the trails means transporting our bike to the trail head. There are many ways to get your fat tired steed to the fun stuff. 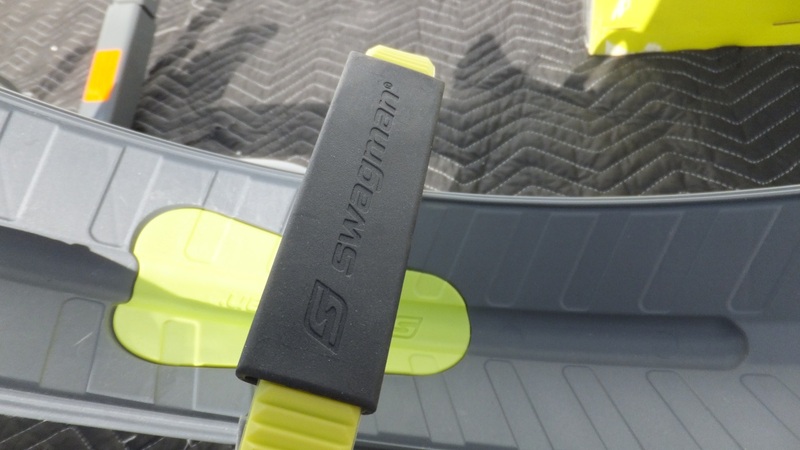 Swagman, located in Penticton BC, have been designing and manufacturing bicycle carrying gear since the early 1990's and have a solution for most of the situations above. 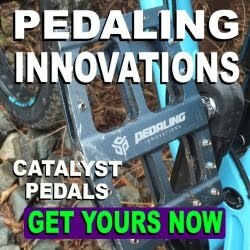 Fatbike Republic reached out to the folks at Swagman when it was discovered that their new fat compliant, hitch mounted rack had zero frame contact. Within a week a Sitkka 2 arrived at FBR headquarters for a closer look. Be sure to check out the detailed video at the end of the review. The Sittka 2 arrived with the box having only a couple of minor superficial scuffs. The handholds and straps made moving the 40 x 24 x 10 box relatively easy. After opening the box it was easy to see that the strategically placed packaging kept all the parts unharmed. When assembling any product its a good idea to first read through the instructions. 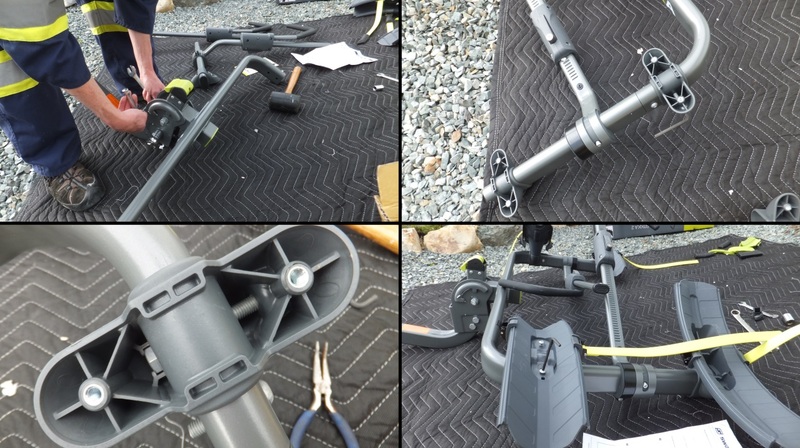 The three pages that came with the Sitkka 2 were pretty thorough and included information on installing it on your vehicle and loading the bikes. The actual assembly is pretty straight forward and is actually detailed on the first page and includes four infographics. I emptied the box, laying all the parts and galvanized fasteners on a 6x8 moving blanket, including two allen keys for the assembly (4 & 6mm). 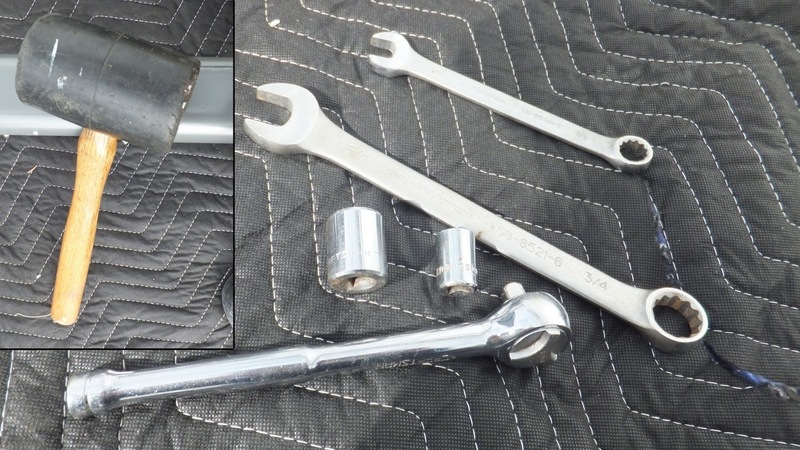 You will also need a 1/2" and 3/4" wrench and/or sockets. I also grabbed a rubber mallet in case something needed a little tap. Following the instructions and the diagrams I had the rack assembled in about 30 minutes. Be sure to check out the video for more detailed assembly. 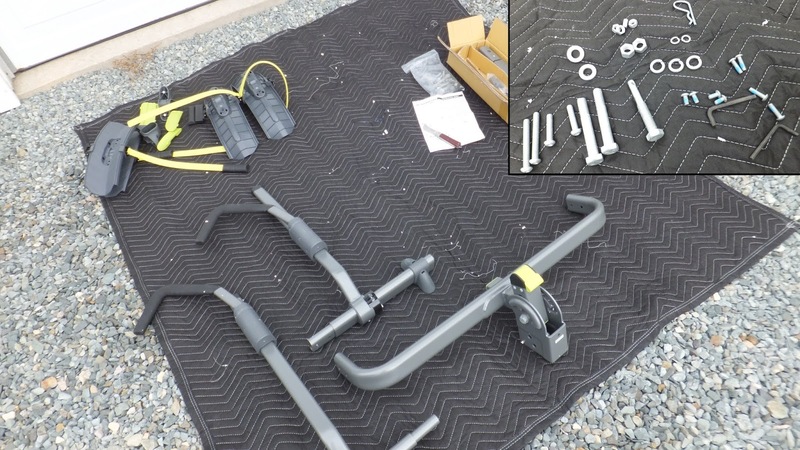 The rack comes ready to fit a 2" hitch receiver, but by removing the "sleeve" it will fit a 1 1/4 receiver. 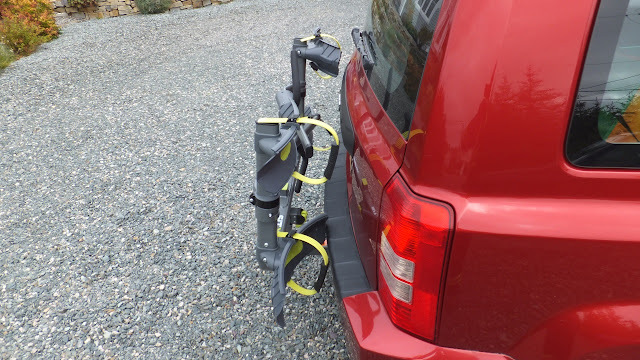 The assembled rack easily slid into the 1 1/4 hitch on my Jeep Patriot. I chose to use the chrome locking hitch pin for the extra level of security. There are a few features that really caught my attention. Firstly, a well padded hook holds down on the front tire and not the frame. 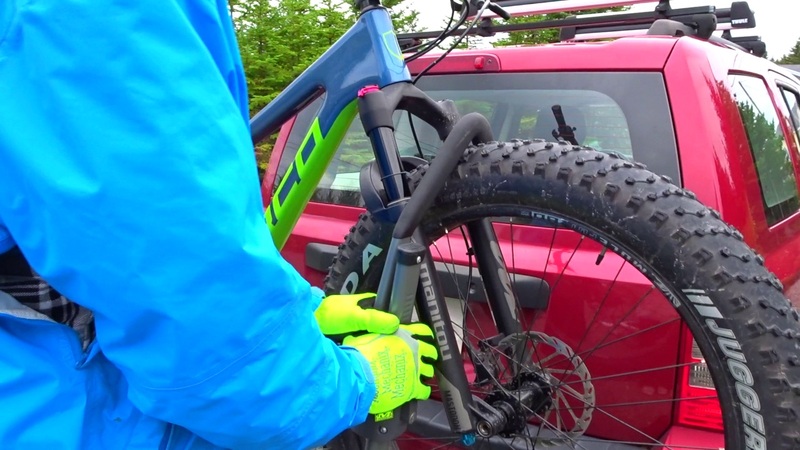 This makes the Sitkka 2 carbon frame friendly as it's generally not recommended to use frame grabbing hooks on carbon framed bikes. 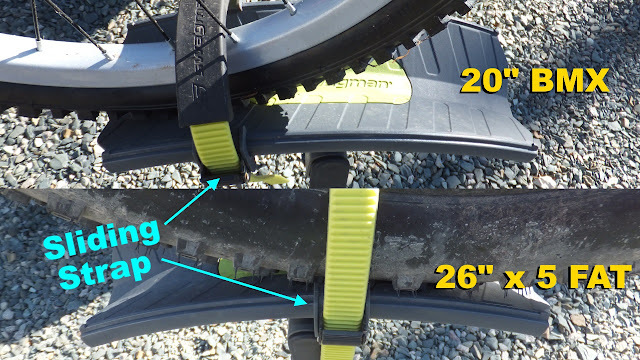 The extra wide "bumpers" on the tire straps is a smart idea when considering the large number of cut-outs in fatbike rims. The hold-down force is spread out over a larger area. I did not initially understand the combination of upturned and downturned tire trays until it was actually mounted to the vehicle. When placing the front tire in the upturned tray, the rear tire will sit ON the down-turned tray. The length of the bike will dictate where the rear tire lands. Aligning the sliding strap mounts with the tire will give the bike a custom fit. The Sitkka 2 practically hugs the vehicle when folded and did not impede driving and parking in any significant way. And the pop of neon green/yellow will make you a little more visible. The Sitkka 2 is very easy to use. 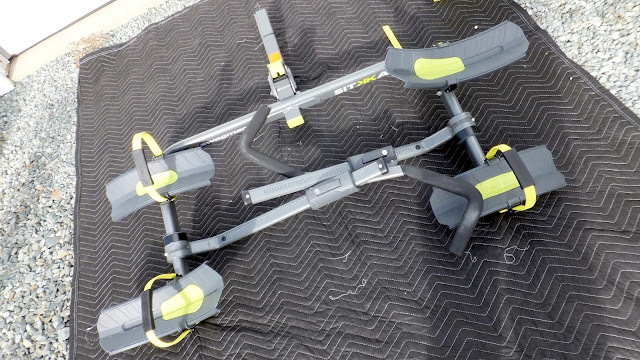 First you lower the rack from the folded position and fold out the arms - to approximately 135 degrees. If carrying one fattie its recommended to mount it closest to the vehicle. Then slide the ratcheting hook to their full extension and release the straps (on both trays) from the buckle. 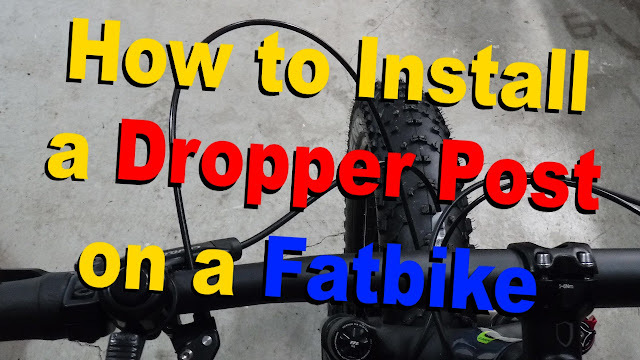 Load your fattie with the front tire tire in the upturned tray, fold in the arm and slide down the ratcheting hook until it touches the tire near the crown. The push down until you hear the click. Finally, align the sliding straps to the center of the tires, slide through the buckle and pull down tight. 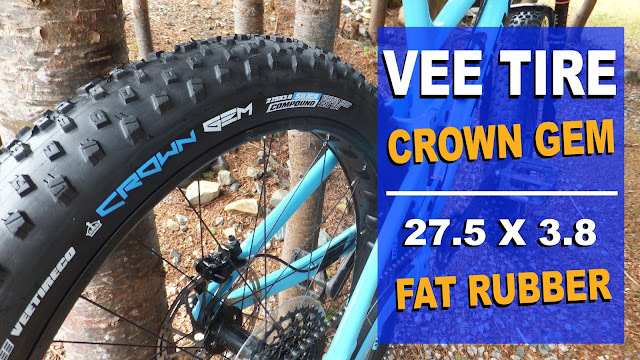 It took me approximately two minutes to load two fatbikes . . . that is pretty quick. 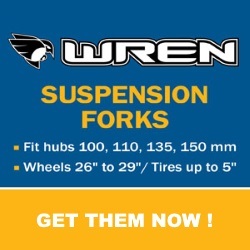 When driving down side roads and on the highway the bikes did not move, nor did ratcheting hook or wheel straps loosen. While not made for off-roading, I did take my Patriot on some dirt roads and the Sitkka 2 performed well. 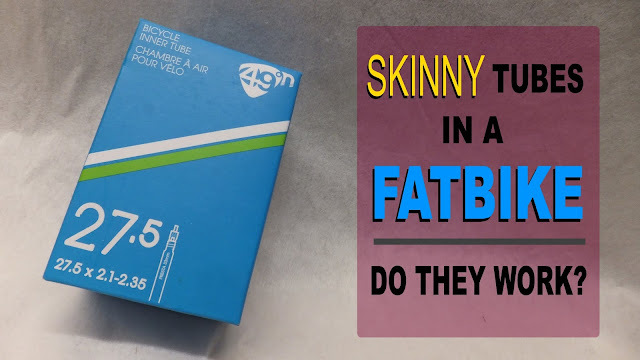 For heavy off-roading I would recommend riding the fatties instead. 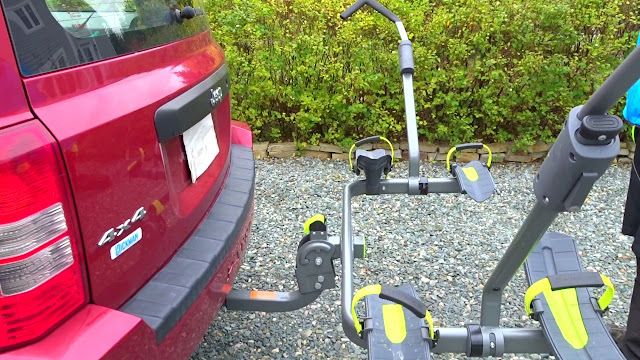 The Sitkka 2 can also easily tilt away from your vehicle by pulling up on the cam lever and lowering the rack. 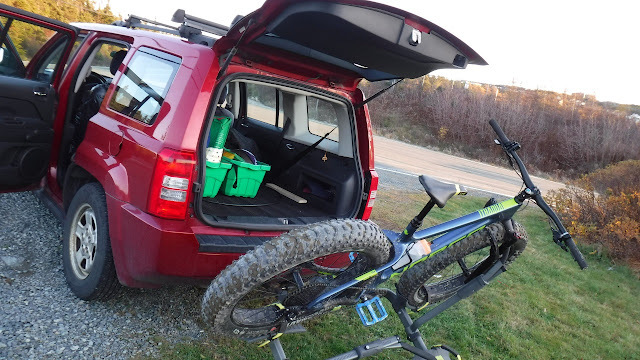 There is no need to remove the bikes from the rack and there was plenty of room to clear the rear hatch on my Patriot. The lock in the ratcheting hook is quite useful when needing to leave your fattie unattended for a short period of time. After hearing the "click" when pulling down on the ratcheting hook, insert the key into the button and turn. 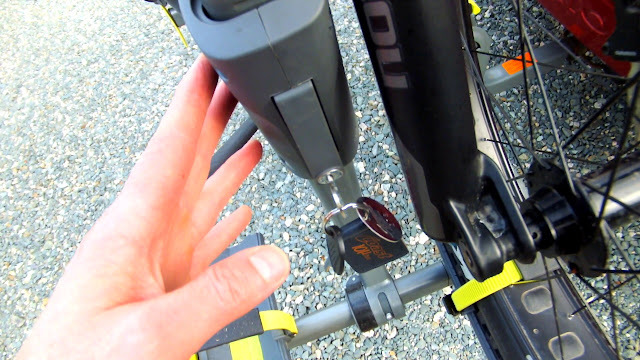 This lock will not prevent bike theft, but it will definitely deter any would be thieves. 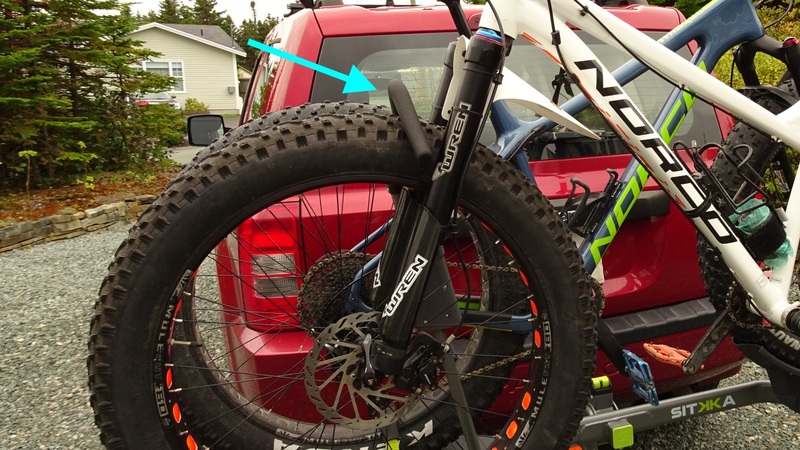 Having traveled several hundred kilometers carrying fatbikes hither and yon, I have to say that the Sitkka 2 is a super quick loading and unloading fatbike carrier. 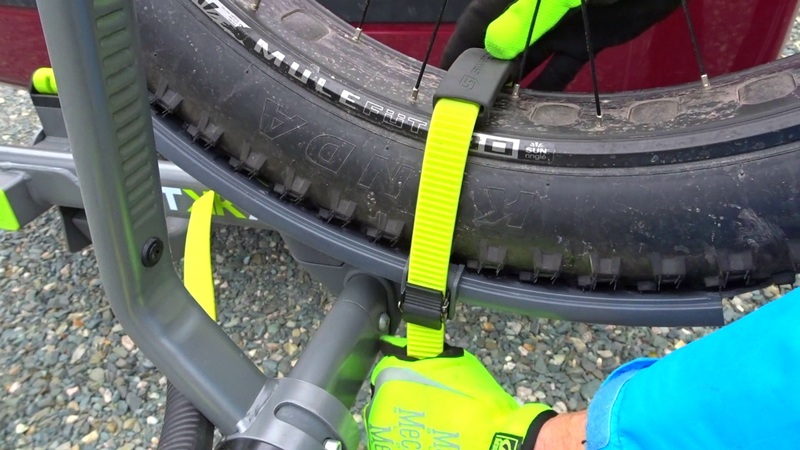 The ratcheting arm (that holds the tire and not the frame) did not need retightening during any trip and the tire straps held the tires confidently. The lock did come in handy when making a quick stop at the grocery store on the way home from a ride. When unloaded and folded the Sitkka 2 practically huggs the vehicle. And even when fully loaded, the rack easily folded down allowing full access to the rear of my Patriot from the fully opened hatch. So if you are looking for a quick loading, hitch mounted, two bike carrier, that will not break the bank and is carbon frame friendly with it zero frame contact . 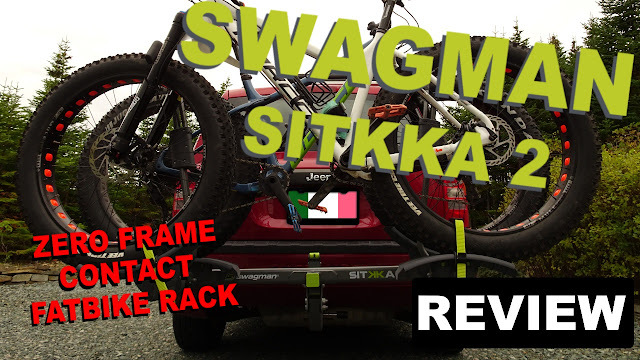 . . be sure to check out the Sitkka 2 by Swagman.